If you’ve ever been inside a Chinese grocery, or a Chinatown, or any Asian country for that matter, you may have noticed a little cat statue with an upraised paw, beckoning you inside. Some are small, some are big, some have mechanical arms to make the arm move up and down. The basic premise is that the ‘lucky cat’ will bring good customers in to your business, and bring money in to your pockets. People have lucky cat keychains, lucky cat stickers, and lucky cat key straps that dangle from their phones. 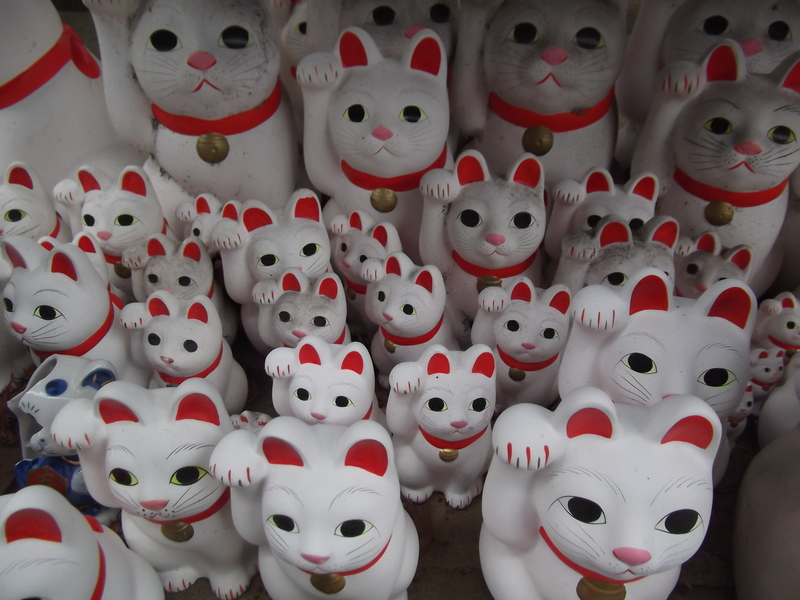 There are lots of various stories about the origin of the lucky cat, but in fact it comes from Japan, and is known as Maneki Neko, which translates into ‘Inviting Cat’, but as it is such a popular figure all over Asia, many believe it to be Chinese, not Japanese. I recently learned that the so-called ‘birthplace’ of the Maneki Neko is right in the town where I live, so I hopped on the train the other day to head to Gotokuji Temple, and see for myself. There were only a handful of people visiting the temple that day, but as I stood there admiring the pagoda a group of three older gentlemen approached, walking with what seemed to be a very enthusiastic temple guide. The guide was holding a folder of close up pictures of features of the pagoda, and they asked me if I could speak Japanese. ‘Just a little!’ I replied. So I joined the group and the guide pointed out the original wooden statue of the cat, hidden carefully up by the roof. Sorry for the lame zoom. I had the small camera with me, not the big one. 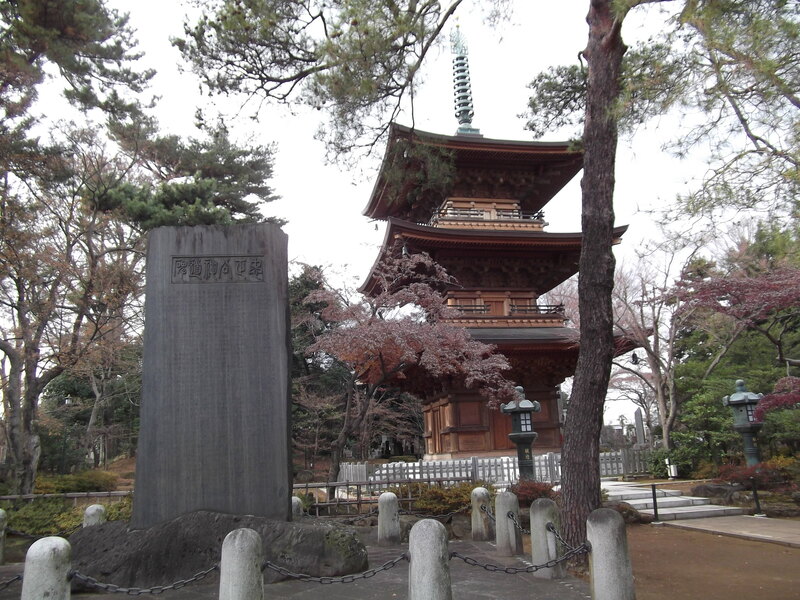 A long time ago, this area of Tokyo was countryside, and Gotokuji Temple was relatively poor and humble. The priest who worked at the temple had a cat, Tama-chan, which he loved dearly, and shared all his food with. One day, the priest fell ill, and he said to Tama-chan, if you are grateful for all that I’ve shared with you in the past, please go out and bring us some luck. So, Tama-chan went out. Later that day, the priest heard a noise outside the temple. In his weakened state he went outside, and saw four finely-dressed samurai warriors. They said to the priest that they were heading back to the castle when they came across the cat sitting in the middle of the road, raising its paw at them, beckoning them to come. They were so amazed by the cat that they followed it, and it led them to the temple. The priest invited them in and served them tea. Just then, out of the blue, a huge thunderstorm hit, with lightning striking everywhere. The warriors were so grateful to have somewhere safe and dry to stay during the storm. 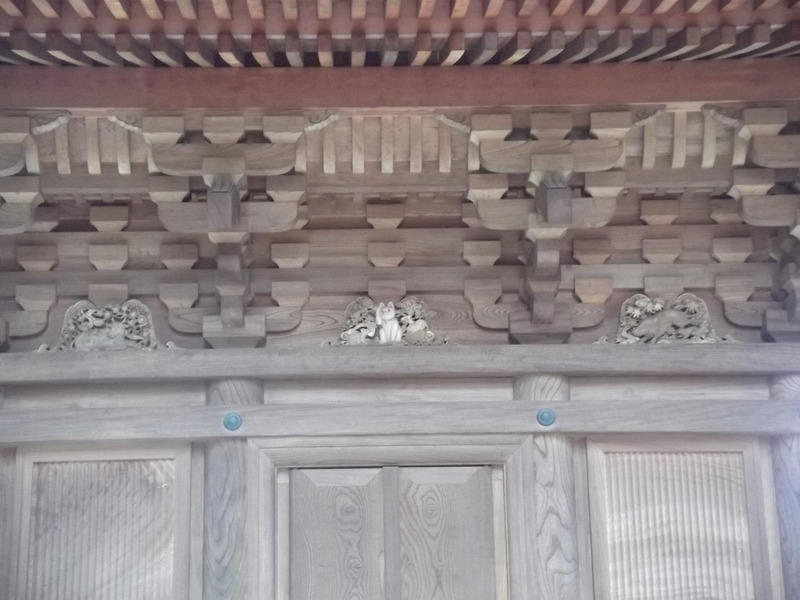 One of the warriors turned out to be a famous feudal lord, and to show his gratitude to the humble priest, he decided to become a sponsor for the temple. When Tama-chan died, the priest made a statue of the cat to commemorate the luck that it had brought to the temple. 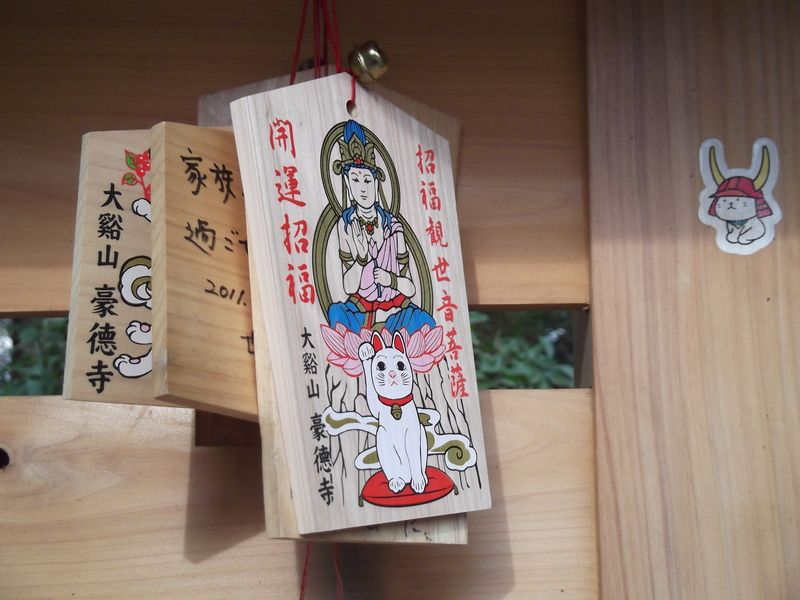 The people in the neighborhood, who knew of the story, began visiting the shrine, hoping to also get some good fortune. 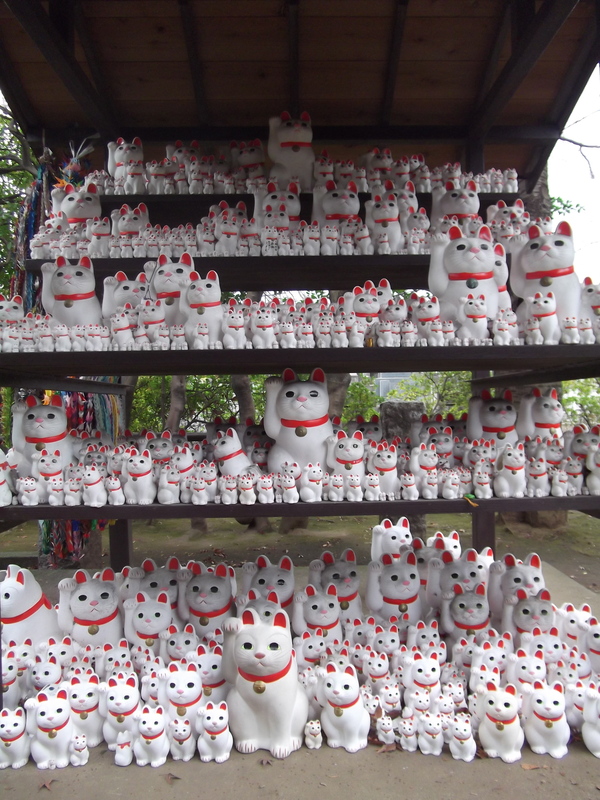 Soon they began selling small statues of Tama for the townspeople to buy as good luck charms. And today, the Maneki Neko is a ubiquitous symbol of good fortune all over Asia. 1. The recommended route is to take the Den-en-toshi line from Shibuya to Sangenjaya, and then change to the Setagaya Line. This is a really cute route because the street car winds through the tiny streets. Get off at Miyanosaka station, cross the train tracks on your right, and the temple is just up ahead on the left. Just look for a huge wooded compound; that will be the cemetery attached to the temple. 2. The other route is to take the Odakyu line to Gotokuji Station, but apparently it is a longer walk. Previous Post Is Colonel Sanders Actually Santa In Disguise?